How can we measure air leakage in buildings? It would of course be almost impossible to identify and measure all of the cracks and holes present in any given building’s shell. Yet these leak sites can be measured indirectly with a “blower door test.” The blower door test measures the airtightness of a building by changing the building’s static pressure with respect to the outdoors and recording the amount of air flow required for that change. The greater the air flow required to change this static pressure relationship, the greater the total size of the cracks and holes in the building envelope. 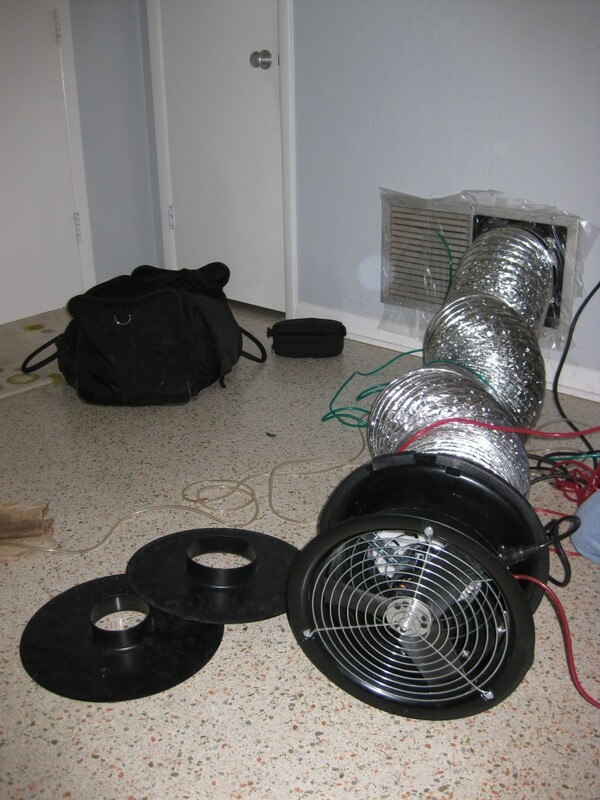 In Florida, it is very common during a blower door test to operate the fan in the depressurizing mode, meaning that air is drawn, pulled or exhausted out of the house. When the fan operates in this way, it is easy for someone walking around inside the home to feel air entering the building through cracks in its exterior envelope (shell). This infiltration commonly occurs around windows, recessed lights, electrical sockets, air handlers, or any feature that penetrates the exterior walls or roof. Inside air leaving the home through the blower (exhausting) has to be replaced with outside air entering the building elsewhere—what goes out, must come in—so spots where air can be felt entering the building are air leakage sites/sources. What do the numbers from the test mean? One measure of a building’s air leakage rate is air changes per hour (ACH), which estimates how many times in one hour the entire volume of air inside the building is exchanged with outside air. To determine a building’s ACH, the blower door performs an airtightness test with the house depressurized (or pressurized) to 50 Pascals. A Pascal (Pa) is a small unit of pressure about equal to the pressure that a pat of butter exerts on a piece of toast. Fifty Pascals is approximately equivalent to a 20 mile-per-hour wind blowing against all surface of the building. How big are the air leakage sites (“holes”) in my house? Now that you know the CFM50, which is the air flow through the building’s leak sites at a 50 Pa house pressure differential, we can determine the approximate cumulative size of the holes. The “holes” in this case are areas of air leakage. In other words, you are trying to determine the approximate size of all the air leakage sites added together. To do so, multiply the CFM50 by 0.13. In our example above, where CFM50 was 1,333, what the approximate cumulative hole size would be 1,333 times 0.13, or 173 square inches. This means that if you added all the air leak sites together in the example home you would find 173 square inches (1.18 square feet) of potential areas that need sealing, caulking, fixing, or some other sort of repair to reduce leakage. 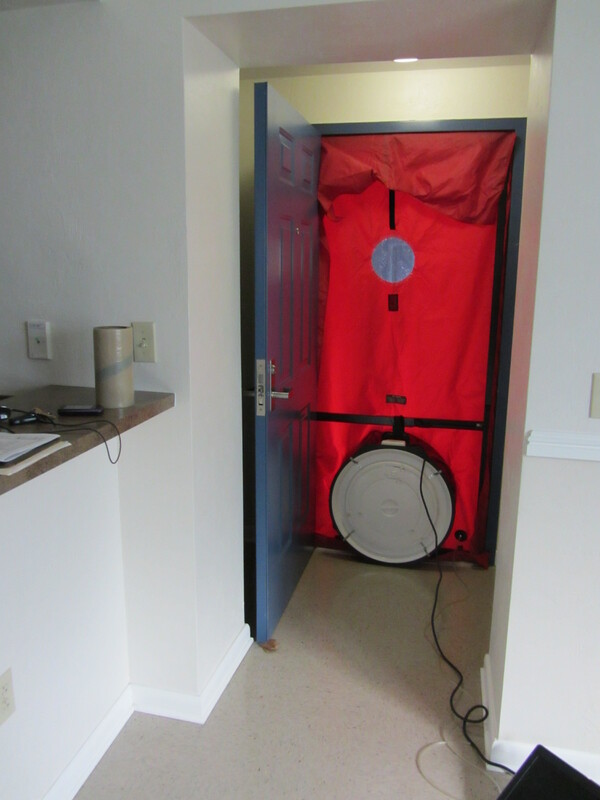 Are there any limitations to the blower door test “finding” leaks? 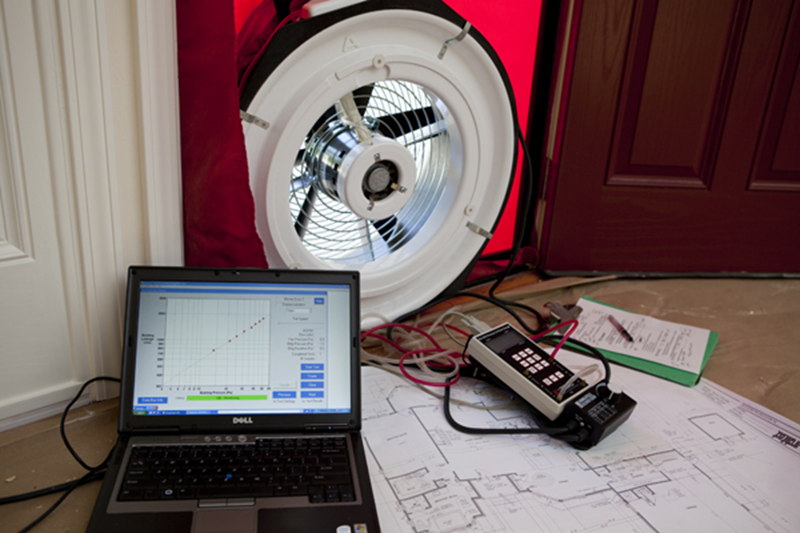 As helpful as the blower door test is in measuring and helping to identify areas of air leakage, it’s important to understand that the blower door test does have limitations with respect to locating all sources of leaks. For instance, sometimes indirect leaks or a combination of very small leaks can exist that cannot be easily identified with a blower door test. In such situations, other tools such as infrared thermometers or cameras (discussed later in this fact sheet) can be used to detect changes in temperature that are indicative of air leakage.